Please note: no business will be added to this page without you requesting it be added. If you at anytime would like it removed, please contact the webmaster. 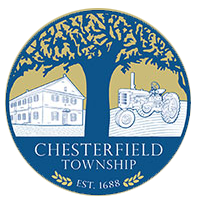 This directory is subject to change and Chesterfield Township reserves the right to refuse a business if it deems necessary. You will be sent a confirmation email as soon as your business is added. Send information to the webmaster here. Myra Wille, your local HALO branded solutions representative, delivers promotional marketing solutions ranging from decorated apparel and logoed merchandise to integrated solutions combing print, web, and product-based designs. With over 30 years marketing experience, Myra will partner with your business, school, or organization to find cost-effective solutions to your promotional marketing needs. Architectural design for residential and commercial buildings. "The leading news source for Chesterfield Township, NJ"
All breed dog boarding, grooming and training. Retailer of Wellness and Old Mother Hubbard products. Open 7 days a week in season: 8:30- 4:30 p.m.
Owners and Chesterfield Township residents Alan and Carol Grossman have been farming since 1990. They are looking for members from the area to join their CSA for the 2011 growing season. From June to November, take home a bounty of their freshly harvested vegetables, including delicious lettuce, salad greens, squash, zucchini, broccoli, string-beans, tomatoes, herbs and cut flowers. This is just a sample of what Chesterfield Harvest offers. For the list of what it grows, to join or to learn more, visit their website. The Grossmans are eager to share their farming experience with the local community. See how vegetables are naturally grown on over 45 acres of beautiful preserved New Jersey farmland. Open 6 days in season 8 to 4:30. We are a Wholesale tree nursery that provides quality finished material to the professionals, re-wholesalers and garden centers..
you're at the right place. Certified Organic Community Supported Agriculture program located on preserved farm on the banks of Blacks Creek. Pick your own crops included in price of annual subscription. We sell seasonal flowers and perennials. Our spring stock includes hanging baskets and pots of Proven Winners wave petunias and a large assortment of perennials. Our cost is low and we will deliver stock to local residents. We will also provide large pots of annuals for display outside of local businesses. Herdt Fencing is a local family business operating in Chesterfield twp for more than 56 years, serving the Burlington / Mercer County area. Installing, Cedar, Alum, Vinyl PVC, Chain Link, Gates and Operators, Kennels, both residential and commercial. Visit our display yard open seven days a week. Studio Amy is a New Jersey creative services studio providing graphic design services, original paintings and illustrations for collectors and licensing opportunities as well as fine art photography prints and photo editing. With over 25 years experience in various creative fields, Studio Amy will deliver a successful and pleasing product for any business or collector. Pink Papillon is well known for creating beautiful custom hand stamped jewelry in precious metal. Designer Mary Ann Springer is known as a perfectionist and for her attention to detail. Membership provides access to the provider law firm in NJ of, Mattleman, Weinroth & Miller. And access to additional firms across the US. Also Identity Theft protection. General practice law office: divorce, real estate, wills, municipal court, corporate matters and more. Private Nursery School, ages 2 1/2 to 6, small class sizes, certified teachers, beautiful country setting, family owned and operated for more than 20 years, very reasonable rates. Pampered Paws is a grooming service that caters to you and your pet by us coming to you. Summer swim team and for children 5-17 years old. Some pool club memberships available. Family-owned and -operated veterinary clinic caring for small pets since 1978. Spay/neuter, wellness exams, vaccinations, x-rays, general surgery, nutrition. We accept cash, checks, and Visa/Mastercard/Discover.